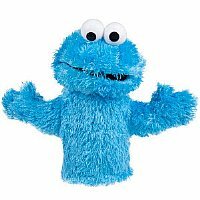 With his soft blue fur and big eyes, this Cookie Monster puppet is set to become an instant favorite with children and adults of all ages. Known for his voracious appetite and his famous eating sound "Om nom nom nom" the Cookie Monster can (and often does) eat anything and everything, but his favorite food is cookies... a great excuse to get the cookie jar out (after all you wouldn't want him to go hungry, would you?). Perfect for hours of imaginative role play.